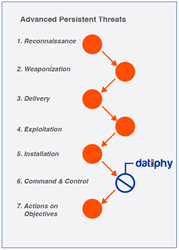 Datiphy Inc., a pioneering startup in data-centric audit and behavioral forensic analysis announced today the availability of their complimentary Risk Assessment Report (RAR) http://www.datiphy.com/rar to identify the risk profile of organizations. Founded in 2015 in San Jose, CA, the Datiphy solution assigns a risk score to every piece of sensitive data within an organization. The key technology is its Adaptive Data Behavioral Model™ (also called DataDNA™) which provides risk assessments by analyzing database transactions in real-time. Our highly scalable solution consists of Host and Network Agents that deliver in-depth activity monitoring of databases. The enterprise level platform uses behavioral analytics, and data-centric auditing and protection capabilities to mitigate risk. For more information, please visit http://www.datiphy.com.